Before You Go Autumn Home Decor Shopping ... Read This! Many stores in our area have autumn home decor out now. 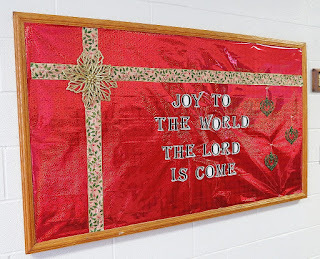 Of course they also have Christmas decorations, too, but that's just wrong. 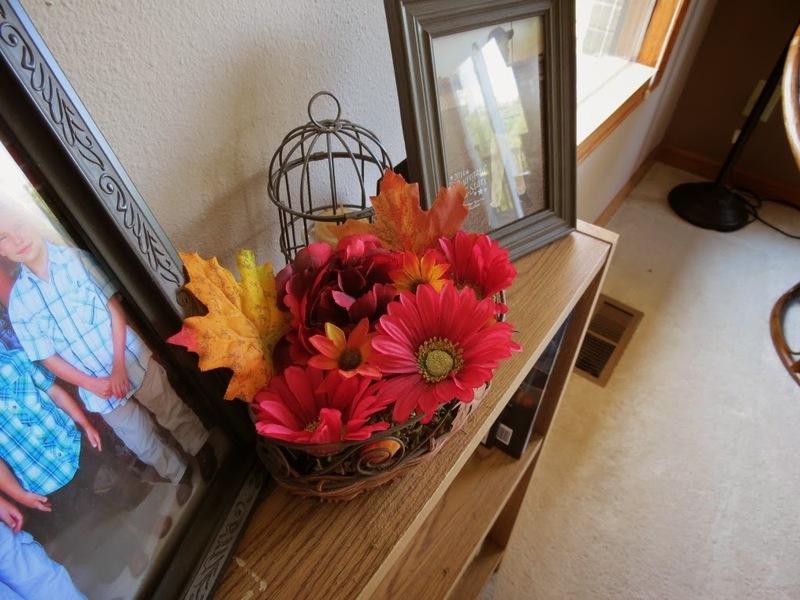 Before you go shopping for new home decor for fall, do what I did - go on a scavenger hunt in your own house. This morning I emptied a closet and boxes in the basement to see what I already had. Why spend good money on something when you probably have something similar already. It's weird how that works. And goodness, did I hit the jackpot. 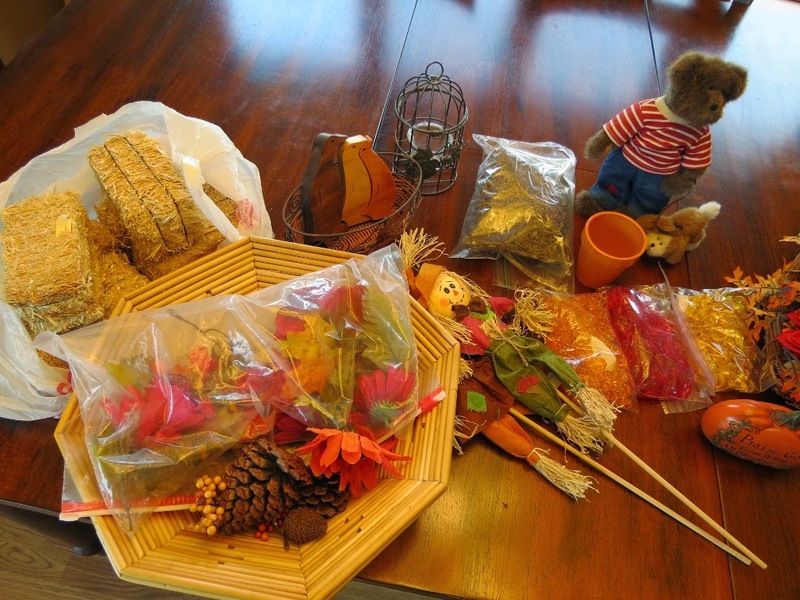 In just two boxes, I found a table full of autumn home decor that i forgot I even had. There were miniature hay bales, lots of fall flowers, leave and moss, plus several baskets and candles. 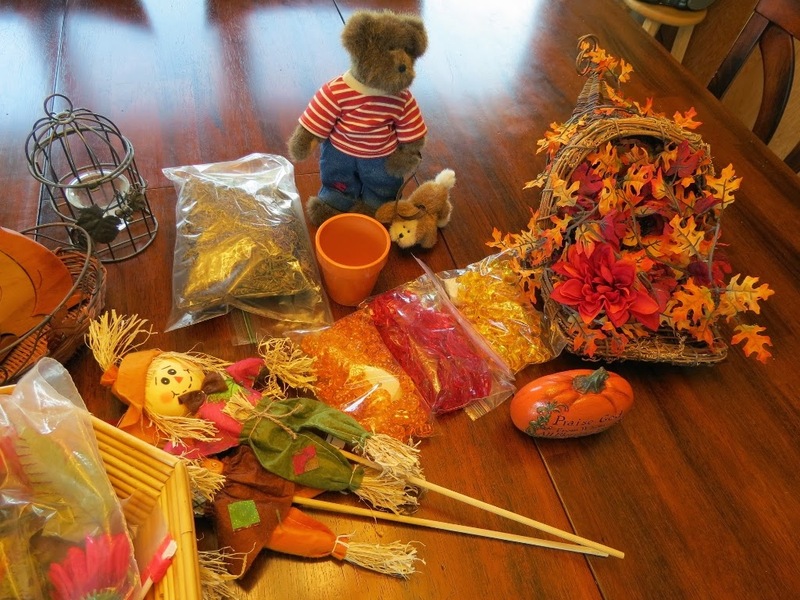 I also found some scarecrows, flower pots, a Boyds bear and some vase fillers. My cornucopia was still mostly put together from last year, and I found a pumpkin with thanksgiving Scripture on it. It was like Christmas, only it was autumn and I already owned it. Even better! 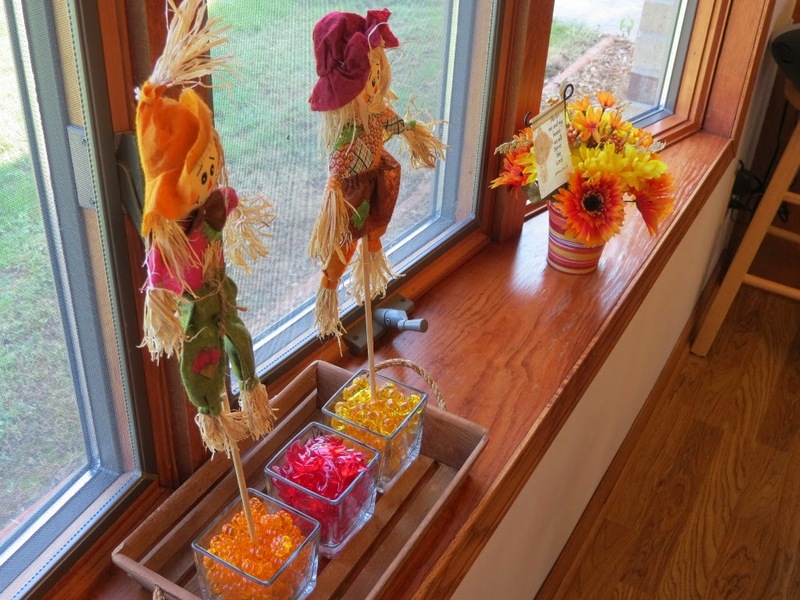 So the scarecrows and vase filler went into glass candle holders in a basket in the bay window of the dining room. 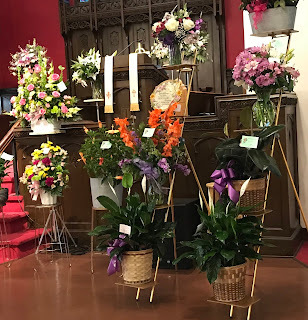 I showed you how to put together the coordinating flower arrangement next to it in a post last week. 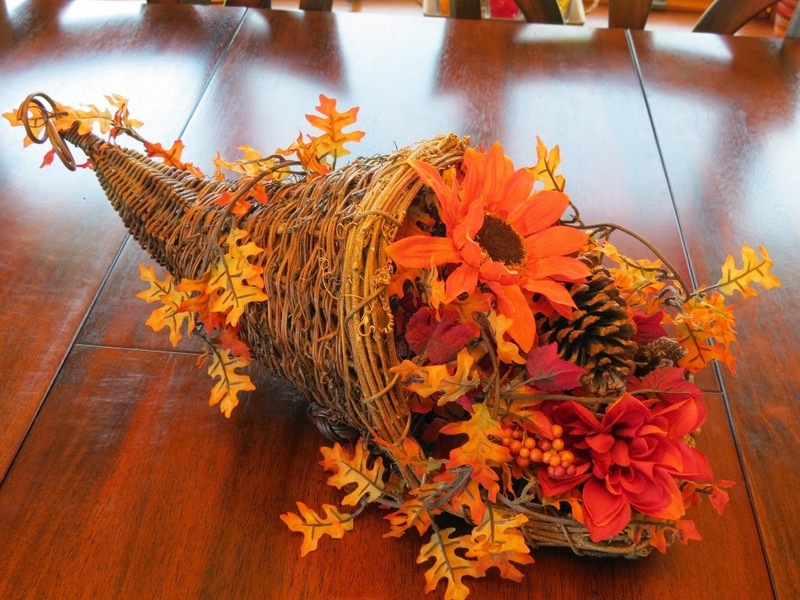 On the dining room table is my cornucopia - one of my favorite pieces. I wrapped it in fall leaves garland and filled it with more garland, flowers cut from their stems, pine cones and battery-operated tea lights. 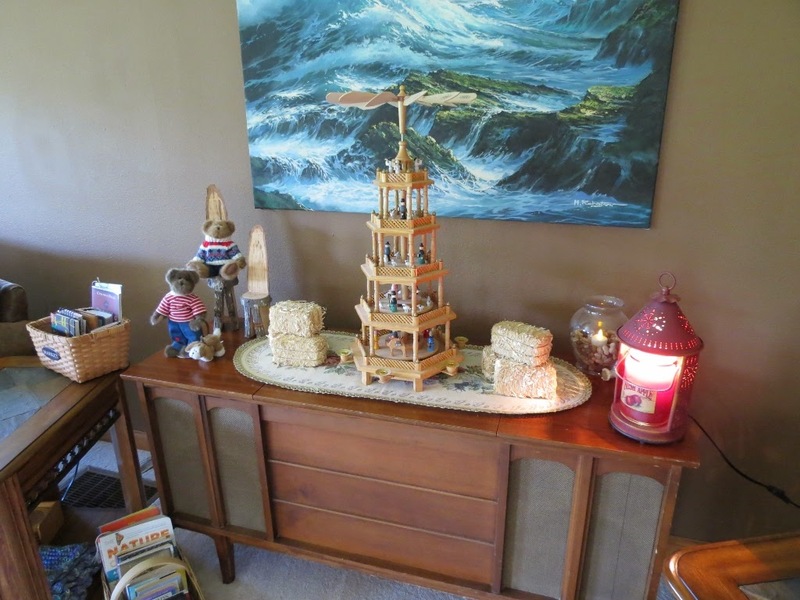 The mini hay bales are on the hi-fi with an apple candle in the candle warmer, a glass vase full of rocks and another tea light, plus some tree branches Danny made into chairs. You'll also notice baskets everywhere - some are filled with books while others have kindling and flowers. You might be surprised at what you have tucked away in drawers and closets that you can use for home decor. Go on a scavenger hunt of your own before you head off to the store to get stocked up. You can save tons of money by reusing and repurposing the things you've used in years past.